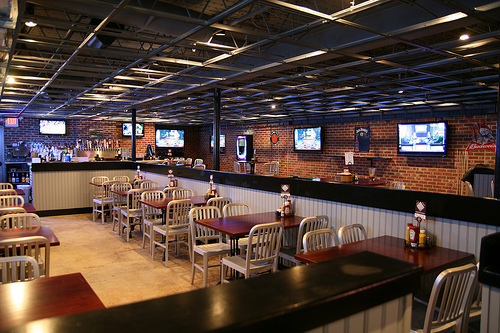 Jake’s Boiler Room is located on the lower level of Jake’s American Grille. This addition is Chevy Chase neighborhood’s newest night life attraction and home to eight large flat screen TVs, billiards, darts, arcade games, X-Box Kinect, and a private cement bar with seating for 15. In addition to the 18 drafts on tap with features such as Abita Andy Gator and Delirium and a full service bar offering your favorite craft cocktails, you can also take advantage of Monday night trivia, a Tuesday night dart league, and Wednesday night karaoke. District Restaurant Group is known for its unique and inviting dining establishments and is also behind The Ugly Mug on Barracks Row, and District 2 Bar & Grille in Glover Park.